The Oakland-born singer returns home for a four-night residency. 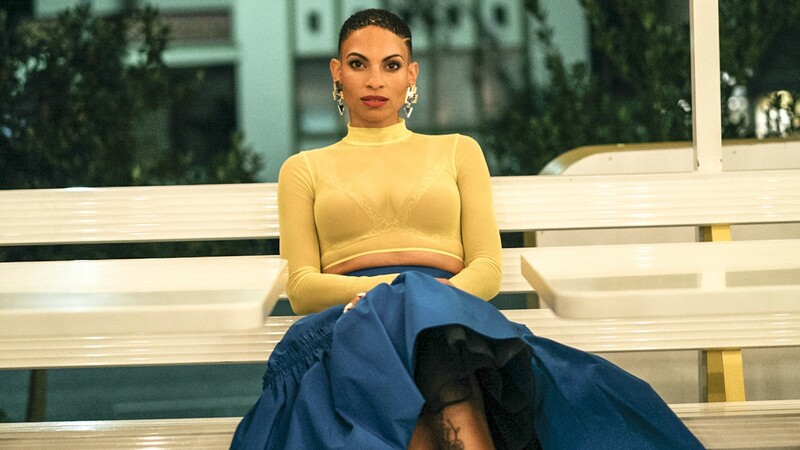 Goapele Mohlabane is coming back to Yoshi's. Goapele Mohlabane looks forward to a special ritual every year: her residency at Yoshi's in Jack London Square. The soulful singer-songwriter will be playing eight shows in November, and while each of her past residencies at Oakland's renowned venue was unique, this year's is even more special. That's because Yoshi's has been closed for weeks getting renovated — including upgraded lighting and a remodeled green room — and she will be the first to play in the refreshed space. Despite living in Los Angeles now, the Oakland-born neo-soul singer is always eager to come to The Town and perform for her hometown fans. And, of course, this is not the first time her hometown alt-weekly has written about her. Since the singer-songwriter first graced the Express cover back in 2009, her career has taken off, and she has evolved as a performer. Certain aspects of her persona remain the same, though, including her social justice advocacy and her role as a mother. (Mohlabane has an 11-year-old daughter named Bahia Osun with husband, Theo Rodrigues.) Back in August, both mother and daughter were together on stage for Kehlani's benefit show at The UC Theatre. As it often is with kids whose parents are singers, Bahia's vocal ability is similar to Mohlabane's, almost ethereal and equally soulful despite her young age. "As a mother, I want to raise an empowered young woman — easier said than done, but I'm trying to open different doors for her," Mohlabane said, gushing about her daughter. Last year, the singer debuted her latest release Dreamseeker during her Oakland residency at Yoshi's, and she will perform songs off this project during her string of November shows, along with selections from the rest of her five albums. "For me, from the beginning when I started putting out music, so much of my journey has been how to do music in the way that I want to, and the way that I love," she said. This latest project embodies much of what her career has been about, and the EP signifies, in a way, coming full circle. "I've been able to stay grounded because I have a good team around me. The first place I started putting out music was on my family label [Skyblaze Recordings], so there's always been an outlet for me," the singer recalled. This unique way of distributing her music through independent record labels has enabled Mohlabane to stay on track, rooted, and not fall prey to the mainstream industry, where musicians often lose sight of who they are as artists. Of course, remaining independent comes at a cost. She doesn't have the same funding that mainstream artists get from major labels to spend on marketing, constant visibility, and radio play. "Everything becomes more corporate owned, and fewer people owning it," she said. Mohlabane is an eclectic singer, whose music and sounds risk getting distorted by the mainstream music world, and she has fought hard to handle her career on her own terms. She doesn't deny that she has been influenced by mainstream artists, the late Aretha Franklin, Prince, and Whitney Houston being some of them, as well as global powerhouses such as Sade and Stevie Wonder. Like the music legends she's influenced by, Mohlabane, in turn, has also influenced younger artists who look up to her social justice-oriented career. Activism has always been a crucial part of Mohlabane's artistry. She's fought for schools to gain more resources for teachers and kids, to reform the prison system, to end police brutality, and for immigrant rights. The song "Stand" off Dreamseeker best describes her stance: Just stand up for something / Don't fall back for nothing / If we don't stand for something / We'll fall for anything. "If we are not motivated, and we are standing on the sidelines, decisions are going to be made that aren't in our favor," the singer emphasized. "It's important to use our voice whenever we can, stay involved, and pay attention." There's also another form of activism that Mohlabane has taken on that deserves praise: the desperate need to preserve the natural resources of our planet by limiting our carbon footprint. With the release of Dreamseeker, Mohlabane also launched a "DreamSeeker lifestyle brand" with limited-edition jackets and other goods. The fashionable artist understands the need for her fans to have access to environmentally friendly clothing. At a time when the current administration is attacking scientists who warn us of the effects of global warming, artists like Mohlabane want to bring awareness to this environmental crisis. "I'm currently collaborating with clothing designer Meyou on an environmentally friendly cutting edge active wear line. In December, we'll be releasing our first capsule with a zero waste philosophy, leaving a light footprint on the environment while leaving your unique imprint on the world," Mohlabane said. The future of the planet, and what we'll leave behind for future generations is something that Mohlabane takes seriously — this future includes her daughter and the children of countless of other parents.